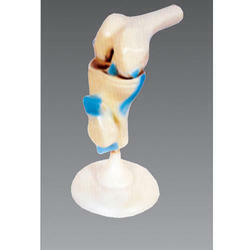 Model of human knee joint. On base. Description:Demonstrate abduction, anteversion, retroversion, internal/external rotation. Include flexible, artificial ligaments. Life-size, on stand. Size: 12x12x33CM. Demonstrates flexion, extension and internal / external rotation. Including flexible, artificial ligaments, Life-size, on stand. We are offering Knee Joint Disease Model to our client. · Demonstrates flexion, extension, and internal / external rotation. Made of PVC Plastic. on Stand. Accurate for Study. Size: 12.5 × 12.5 × 32cm. Life size, on stand. Demonstrates flexion, extension, and internal/external rotation. Includes flexible, artificial ligaments. Life size. A fixed type to show the general features of the knee joint. On base. An instructional model to illustrate the ligament connections.Fully flexible joint to demonstrate abduction, anteversion, retroversion and internal / external rotation. Made of PVC plastic , on stand. This mini size Muscled knee joint model shows femur, fibula, patella & tibia bones. It includes anterior cruciate ligament, quadriceps femoris tendon & also other ligaments & tendons. Accurately moulded articulated model on plastic base. Showing lateral femoral condyle, patella, tibia and fibula. 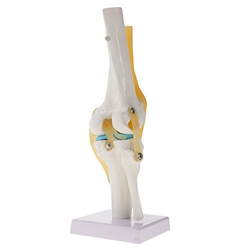 This knee joint model is an indispensable tool for educating patients and students and this can be modified as per specific requirements. Useful for hospital promotions, doctor gifts, medical promotions, Pharma promotions. The 12 parts can quickly be removed for easy demonstrations both in medical training and patient education. The muscles and muscle portion can be taken off for detailed study of the deeper anatomical layers. Colour-coded and raised areas indicate the muscle origin and insertion points on the femur, tibia and fibula. Demonstrates flexion, extension and internal / external rotation. Includes flexible, artificial ligaments. Life size, on stand. Demonstrates flexion, extension and internal/external rotation. Includes flexible, artificial ligaments. Life size, on stand.